The upcoming Action, Thriller Bollywood movie titled "Romeo Akbar Walter" is a Direction of Robbie Grewal and has been produced by Viacom18 Motion Pictures. The film is also written by Robbie Grewal. Firstly the lead was to play by Sushant Singh Rajput, but due to his Prior Commitments he was unable to do this film and Was replaced by John Abraham. Mouni Roy is going to play the female lead in the upcoming Bollywood film "Romeo Akbar Walter", While Jackie Shroff, Sikandar Kher, Govind Namdev, and Boman Irani will be playing the Supporting Roles in the film. The film is all set to release on 5th of April, 2019 (Friday). The film will be having a competition of PM Modi, Another Bollywood film So the numbers can decrease slightly. The Movie is going to have an opening day of around 04-07 Crore Indian Rupees. 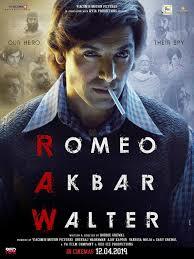 Romeo Akbar Walter is going to have a weekend of around 13-15 Crore Indian Rupees. The film will have a life time business of Around 70-90 Crore and shall be considered as an Average movie at the box office.